The vast 3 acres of land that surrounded my boyhood home was littered with box elder trees. These trees were fabulous for recreational climbing as well as escaping the retaliations of younger siblings. Yet, these trees were notorious for falling limbs…blowing down during thunderstorms and taking all of our summer freedom and childhood dreams of play away as we spent endless hours pulling stumps. It is possible that the “stump grinder” had not been invented yet. Though it is more likely that my father was unwilling to rent or hire out the job of grinding the stumps…because it is much cheaper to replace ax handles, bandage up bleeding heads and rebuild manual transmissions. My dad, two brothers and I picked up the tools and got to work. We chipped away at the ground around the stump, following the roots out until we could sever them with the ax. We hacked away at the roots one by one...digging deeper and deeper as we attempted to get under the stump. We would jab away with an old steel ice chisel until we could get a logging chain wrapped under the belly of the stump. We would secure the other end of the chain to the Chevy Silvarado…back the truck up right to the edge of the stump…rev the engine…dump the clutch and gun it. The truck would come to an abrupt bone crushing stop! We usually remembered to secure our seat belt…after we peeled our teeth off of the steering wheel from the initial attempt. This pattern continued until the stump would finally come free. The only thing better than using a 4x4 to pull stumps…is to use a future son-in-law’s 4x4 to pull stumps. In times of old it wasn’t uncommon for a young, bespoken, affianced man to pay a dowry for the hand of his soon to be bride…or in some rare cases…the use of your 4x4 to pull a stump…and perhaps the cost of a new bumper…seems a fair price. 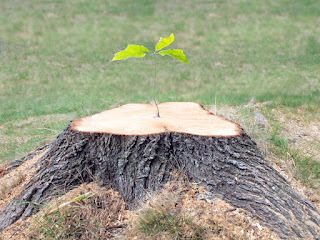 If stumps are left in the ground…it is not uncommon to see some life still spring up from the base. Small young branches may sprout and grow. However, when the roots are cut…and the stumps removed…that tree is gone for good. There is a story in the book of Daniel…chapter 4…about how God cuts the king of Babylon, Nebuchadnezzar, down to size. Nebuchadnezzar’s pride and arrogance is over the top. Nebuchadnezzar sees himself as the mightiest man in the world…yet, God does something remarkable. God removes him from power…he cuts him down. Yet, God leaves the “stump.” God cuts Nebuchadnezzar down…not to destroy him…but rather to draw the king to himself. God leaves the roots and the stumps because he desires to put Nebuchadnezzar back on the throne. God changes Nebuchadnezzar’s heart from a heart of stone to a heart of flesh…and he does so, through some very painful experiences. In the end Nebuchadnezzar glorifies God and praises him for what He did. Can you praise God through the pain? Will you?